Posted on May 26, 2016 at 3:54 am. Net Entertainment’s new pokie Football: Champions Cup has launched and G’Day casino is offering players the chance to win a PlayStation 4 just for trying the title out. Players can also take advantage of 100 free spins on the game simply by opting in for the matched deposit bonus. When you go to make your next deposit simply indicate you want to opt in for the bonus of up to $200 matched by 200% and you will be credited with 100 free spins on Football: Champions Cup. Hurry though, as this offer runs out in the next 24 hours. Net Entertainment’s new pokie is a football (or soccer) themed title released just in time for the UEFA Euro 2016 kicking off in June, and it allows you to really get amongst the action. When players first open the 5 reels and 20 paylines pokie at GdayCasino.com, you will be prompted to pick a team from 24 teams which are participating in the UEFA Euro 2016. You can also have the game randomly select the team for you. Gameplay and graphics are slightly altered, depending on the team you pick, but not by much. While 3D Sound – NetEnt announced would be their next big thing – hasn’t yet been added to their pokies yet, the noise of the roaring crowds does surround you. The base game offers special Wilds with great payouts and there’s a few interactive features to the game too, including a Free Spins feature and a Pick Me Bonus feature. 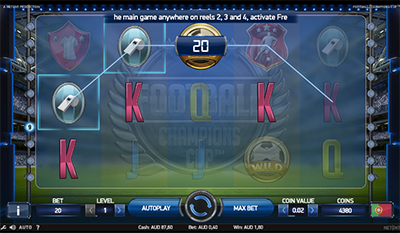 The Pick Me Bonus is known as the Penalty Shoot-Out Bonus and is activated by spinning at least three Bonus symbols. The screen will transform and you will be able to pick positions to kick a goal, as well as to save when acting as the goalkeeper. Cash payouts are won by scoring goals and multipliers are applied by saving them. The Free Spins feature is known as the Free Spins Tournament, and is activated by spinning three Free Spins symbols. You will be taken to a new screen featuring the knockout tournament, with four rounds of free spins eligible to win. These correlate with the knockout rounds including the Last 16, Quarter Finals, Semi Finals, and the Finals. Each round you get to will score you six free spins, with extra Wilds and Scoring Wilds. If you make it to the finals and win you will score up to 500x your initial stake, with cash prizes for second and third place too – plus the winnings from the free spins. Head over to G’Day casino now and kick some goals for your chance to win a PS4 and other great prizes.